This is a blog devoted to folk art both traditional and contemporary. It is written by Shaun Markey. Folk Art in the Attic is also the title of Shaun's book describing 35 years of picking, collecting and dealing. The book is available from Chapters, Amazon and Barnes & Noble. Shaun writes for the Maine Antique Digest, Canadian Antiques and Vintage, The New England Antiques Journal and The WayBack Times. Two weeks ago I visited the daughter of Mr. Fred Bailey near Shawville. She had been in touch with me after seeing one of her father's carving in my recent interview with Joel Haslam of CTV News. I had earlier sent Joel a copy of my book and when he received it, called me right away for the interview. Joel is also a collector of Canadian antiques and folk art so he was quick to pick up on my suggestion about an interview on folk art. I had also included a photograph of one of Mr. Bailey's carving in my book Folk Art in the Attic. Here's the photo from the book of a piece titled "Haying 1920's". I spent a pleasant hour with Mr. Bailey's daughter chatting and looking at the carvings she has in her possession. In total she estimated her father produced only 80 carvings in a ten to fifteen year period. The majority of them featured horses which he loved his entire life. His daughter told me a sad and touching story about how her father lost the 198 acre family farm in the Eastern Townships during the township. Down but not out, Mr. Bailey and his wife left and travelled to her home town of Shawville, Quebec north west of Ottawa where they hoped to make a new start. Mr. Bailey's spirit was tested again when en route his horse was injured and had to be destroyed. Undeterred, Mr. Bailey and his wife travelled on to Shawville and successfully restarted their lives. He worked a number of jobs and finally settled on carpentry as his main occupation, one he was to pursue for the rest of his working life. While she had several examples of his work there that day, his daughter was not interested in selling any of them. I wasn't surprised at that. If I was in her position, I wouldn't sell them either. So I had to satisfy myself with taking photographs. A few weeks later I was casually looking at FaceBook and you can imagine my surprise when this terrific wood carving by Mr. Bailey turned up at the Elora Antique Show. Reacting quickly, I messaged a friend who was exhibiting at the show and he purchased the piece on my behalf. Another dealer friend who was exhibiting at the show brought it back to me in Ottawa. Mr. Bailey mounted all of his pieces on short wood planks. On the edges of the plank he typically would engrave a title, his name and the year he created the work. This particular piece is dated 1974. 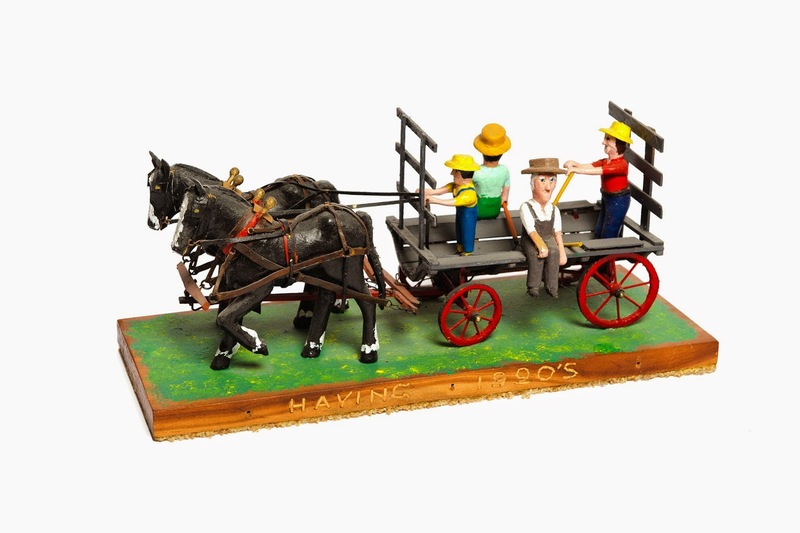 Mr. Bailey's work exhibits the characteristics of excellent folk art: inspired carving, memories of days gone by, naive yet charming execution, a strong sense of purpose and confidence. It's not surprising that horses are featured in so many of his carvings. Horses were obviously a very important part of his life and community. The work of folk artists typically reflect the community in which they lived and their traditions. Mr. Bailey's work is no exception. If and when you decide to collect a particular folk artist, you'll want to do your research. Learn about the artist and their life and how it is reflected in their work. Talk to their family and relatives. Knowing the details of their lives enriches the collecting experience and your collection. It so happened that Mr. Bailey's daughter had a similar piece to the one I purchased in her collection. That was important information and enabled me to act quickly when I saw the piece on line. The carving is called The Race and features a standardbred horse race with four colourful participants. It is dated 1974 and signed by Mr. Bailey. It is said that the work of folk artists reflect the personality of the artist. An excellent piece of folk art should inform the observer about the artists' way of life and their feelings toward the environment that surrounded them. Clearly, Fred Bailey accomplishes this in his wood carvings. It was a thrill and a happy coincidence to acquire the new piece by Fred Bailey. Hopefully, I can add another one to the collection in the not too distant future. Enjoying the Cure for Cabin Fever - The Kingston Winter Antique Show!